Schaghticoke: an early tech valley? Well, I’ve been having a great time writing about Schaghticoke in the Civil War. I may be a little obsessed, in fact. But there is so much more to write about our local history. I started out writing a history of the town, bit by bit, in September 2010. I had only reached the early 19th century in the basic history of the town when the 150th anniversary of the Civil War intervened. Though I have been doing extensive research on all our Civil War veterans and have in fact written hundreds of pages that you haven’t read yet, I’ve also been continuing to delve into the basic history of the town. One area that I thought I knew well was the early industrial history of the town, but I’ve found there was much more to learn. As I have written before, New Englanders moved into Schaghticoke after the Revolutionary War. Some sought unsettled farm land. But others were seeking waterfalls, source of power for mills. Textile mill technology was developing rapidly, not unlike the computer/technology revolution of the last 25 years. The first power spindles for fiber were made in the US about 1790, and by 1810 had spread all over the East. 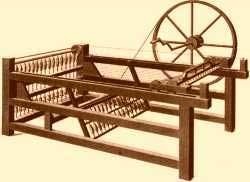 The first power loom was made in the US in 1814, but spread equally rapidly. The design of the first power spindles and looms were essentially stolen from Great Britain, but US inventors worked hard to improve them and patent their own designs. In Schaghticoke, the first bridge went over the Hoosic River at the village of Schaghticoke in 1792, and there was a textile mill- just finishing already woven cloth- right away. Other mills followed in 1810, 1811, and 1814- a village sprouted. And the mills drew not just investors, but also inventors. I recently discovered a young man named Oliver Barrett. He was born in Hudson Falls about 1783, the son of a Revolutionary War veteran. By 1808 he had filed for his first U.S. patent, on a fanning mill for grain and clover seed. This would separate wheat from chaff. But Oliver moved on to a center of textile innovation- Schaghticoke- and filed a patent here in 1811 for a machine for roving cotton: a spinner. This would take carded cotton and spin it into thread automatically, doing the work of many hand spinners, much faster. The machine would process wool “fine enough for broadcloths, or sufficiently coarse for carpeting and rose blankets – and cotton may be spun fine enough for domestic purposes.” A child of twelve or fourteen could be taught its use in two or three days and it was “not liable to be put out of repair- and may be built with any number of spindles.” This machine was so innovative that former President Thomas Jefferson wrote to Oliver, seeking to purchase one of his machines. This post originated from use of a new online archive, http://www.foundersonline.com, which includes the papers of the early Presidents of the US, searchable. It is amazing to me first that Thomas Jefferson was interested in improvements in fiber processing, and second that he knew about and corresponded with a young man from this area. I had thought of New England as the hotbed of textile innovation, but apparently upstate New York was as well!